‘Stop, Brexit!’ activist Steve Bray shouts at 6pm everyday outside the gates of Parliament — attracting the ire of TV news reporters and the admiration of Remain campaigners. This morning he was gleefully barracking Brexit minister Kwasi Kwarteng, proclaiming that last night’s events in Brussels could mean “the end of Brexit”. For after nine hours of fractious talks, EU leaders rejected Theresa May’s request for another short delay to Britain’s departure date and instead settled on October 31 — Halloween. The date was picked not just for the symbolic reason that it will delight headline writers for the next six months but November 1 is when the new European Commission is appointed, so the idea is to try and resolve Brexit before a new team comes in. That said, there is a scheduled summit of EU leaders on October 17 which could potentially agree to delay Brexit even further — throwing the process into a seemingly never-ending cycle. Mrs May is however desperate to try and resolve the issue before the European parliamentary elections on May 23. 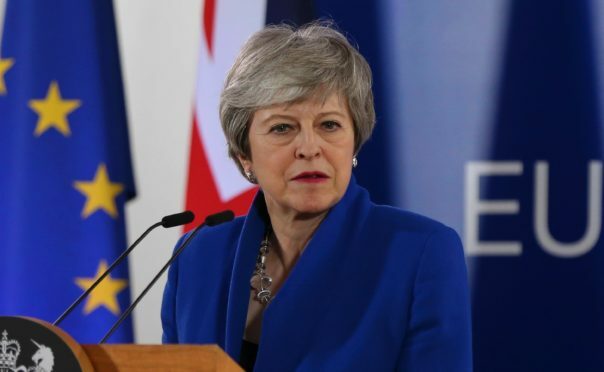 Speaking in Brussels in the early hours of this morning, she said: “I continue to believe we need to leave the EU with a deal as soon as possible. “And vitally the EU have agreed that the extension can be terminated when the Withdrawal Agreement has been ratified, which was my key request of my fellow leaders. But as Mrs May said herself, prior to her deal being defeated for a third time on March 29, “the numbers in the House will not change. The numbers across the House will be same”. Indeed unless Labour decide to dramatically back a compromise deal, the next six months of extra time will do nothing to break the impasse and means EU elections, three years after the UK voted Leave, are all but inevitable. The situation leaves Mrs May in a precarious position and those agitating for her departure could well make a move. A new leader, whether Brexiteer or Remainer, would face the same challenge however and that makes a general election or second referendum the necessary, or the only, action that can break the deadlock.